The holiday season seems to have an extra added rush factor. All the usual to-do’s get compounded with decorating, baking, entertaining, shopping, and wrapping. I’m one of those people who really go all out with the decorating part. It took days to get my five, yes five, trees decorated along with putting up wreaths and other holiday décor. I needed something quick and easy to make after a day of ornament hanging. I went in the kitchen and about 30 minutes later I had pan-seared salmon with asparagus ready and on the table. Sauce is a kicker to so many things. It bumps up, enhances, or adds flavor to simply seasoned meat, seafood, or vegetables. The homemade dill sauce for this recipe does that beautifully. It takes minutes to make and truly compliments salmon. I suggest making it a day in advance or perhaps in the morning. The flavors come together nicely after chilling for hours. Roasting vegetables brings in another level of flavor. It’s one of my favorite ways of preparing them along with grilling. Asparagus roasts fairly quickly. Watch it and take it out of the oven as soon as you see it lightly browned. The time will depend on the thickness of the spears. While it is roasting you can be searing the salmon. Then all that is left is plating. Put the pan-seared salmon over roasted asparagus and then top it with a dollop of dill sauce. A clipping of dill fronds makes a pretty garnish too. What else can go with pan-seared salmon with asparagus? I suggest rice (instant or quick-cooking for quick preparation) or bread. I served mine with Buttermilk Rolls. I had extra pre-baked rolls in the freezer so it was easy to quickly re-heat them in the oven. What about the rest of the week? Below are links to more Weekday Supper recipes that are great for homemade meals to make on busy days. 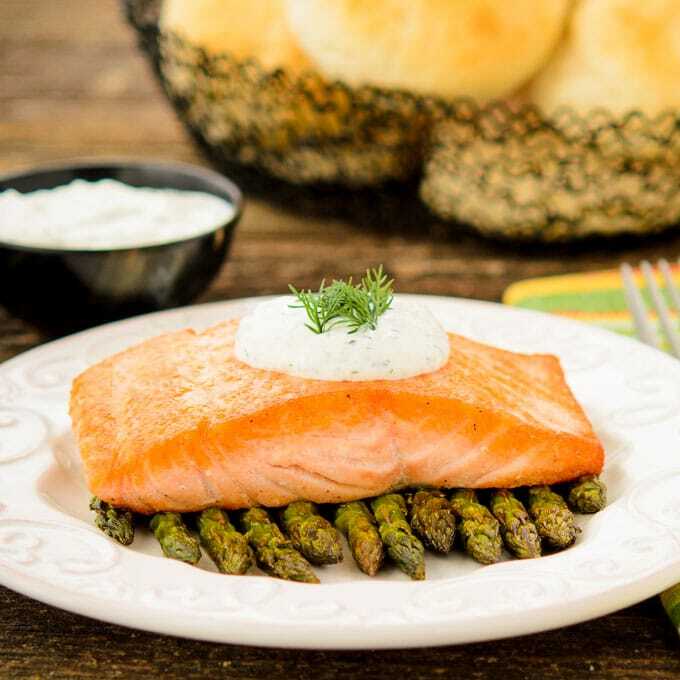 This pan-seared salmon with roasted asparagus is served with a homemade dill sauce. It is an elegant meal for any night of the week. Break off and discard the tough woody ends of the spears. Place asparagus on a rimmed baking sheet. Drizzle with olive oil and toss to coat asparagus. Arrange asparagus in a single layer. Sprinkle with salt and pepper. Roast until crisp-tender, about 15 minutes. Heat oil in a large skillet over medium-high heat until hot but not smoking. Dry salmon filets with paper towels and season with salt and pepper. Place salmon top side down in the skillet. Cook 2 filets at a time if needed to allow spacing between filets in the pan in order for them to sear properly. Cook salmon for 2 to 3 minutes until edges are browned. Flip salmon and cook 2 to 3 minutes until the center is opaque or to desired doneness. Stir together sour cream, dill, garlic, mustard, salt, and pepper in a small bowl until combined. Serve immediately or make the sauce a day in advance and chill until serving. Divide asparagus and arrange on the center of four plates. Set a salmon filet on top of each. Put a dollop of dill sauce over filets or serve on the side. Garnish with fresh dill fronds if desired. Oh my goodness I love this recipe and can’t wait to make it this weekend! DEEEEELICIOUS!!!! Salmon is so easy and tasty, you just cant go wrong there Renee! Looks fab! I love salmon and this is definitely one of my favorite salmon recipes. The asparagus…the sauce, definitely heavenly! 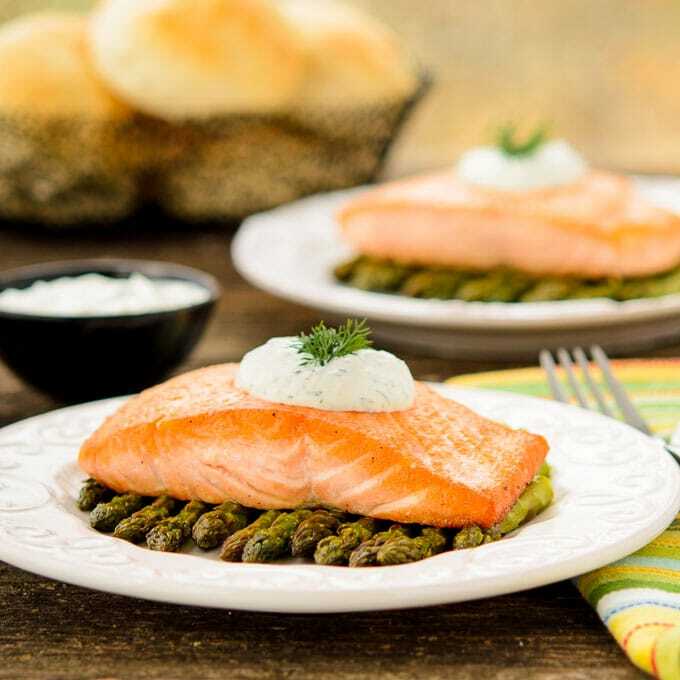 Salmon is one of my go-to dishes to cook when I need something quick, Renee, so thank you for this beautiful recipe! Such gorgeous colors and flavors! 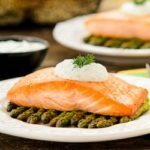 As a huge salmon fan, this recipe is perfect for me. 🙂 It looks so delicious with the asparagus, my mouth started to water. If you have any great salmon recipes, please let me know. Thanks! Mind-blowing blog content.Really informative and impressive post you’ve written, this is quite interesting and i’ve went through it totally, an upgraded information is actually shared, keep.